Tag Archives for " Yana Nirshberg "
I spend a lot of time online. Whether it’s at work researching and managing my clients, at home browsing my favorite blogs and shopping, or on the go using Uber and Google Maps, I usually always have a way to access the Internet. Throughout all of my Internet time, and in the last few years especially, I have noticed a shift in how businesses portray themselves online. Gone are the days when there was a specific formula for mapping out website navigation, organizing content and images, and displaying a prominent call to action. Now with greater accessibility to the Internet through various devices, coupled with the advancements of modern technology, browsing the Internet has truly become an experience for the user, with tremendous advantages for businesses. Just as a brand’s physicality is an experience in itself, the digital presence of a brand should reflect that experience in a similar light. The evolved user experience is no longer the traditional model of providing information. It’s using technological enhancements, like responsive design, better navigation, higher resolution visuals, storytelling capabilities, and many more techniques in order to attract your visitors, keep your visitors, and finally, convert your visitors. Below we elaborate on these advantages of an experiential website.Advantage: Attract your visitors. 1. Advantage: Attract your visitors. There are many ways to create an experiential website. When you find your creative team to design and develop it, part of their market research entails researching your competition and your customers. They will be able to tell you what your competitors are doing correctly and where they are failing, so that you can take the opportunity to surpass them. More and more companies are investing in the user experience, because their customers are expecting it, especially those of the millennial generation. The importance of responsive design and mobile marketing, for instance, is more important now than ever, as studies have shown that businesses that incorporate this into their experiential website, are thriving. Take advantage of the opportunity to stay ahead of the competition and attract visitors to your website! 2. Advantage: Keep your visitors. When users have a positive experience on your website, they are more likely to return. This in turn provides you with loyal customers who then become brand advocates, in other words, your greatest referral database. The research that is used to attract your visitors is additionally applicable to the ways in which the website will retain them and keep them coming back for more. Bounce rates have exceedingly increased, due to the lack of an experience. Once you have this research that demonstrates what your users are looking for, it will be far easier for you to tweak your user experience to their tastes. Give your customers a seamless digital experience so that they can find all of the information they are looking for, when they want it, all while enjoying it. The best way to retain your visitors is to constantly and continuously give them what they want! 3. Advantage: Convert your visitors. We often hear from business owners that the user experience of their website comes secondary to their bottom line, which is to simply have a digital presence so that they can increase online sales. They don’t know how to justify the ROI of an experience. However, now that we know that your visitors are looking for these experiences and transforming into brand advocates because of these experiences, we can expect to see results in the sales cycle and in revenue flow. Guesswork and experimentation are no longer necessary when your users are entertained, moved and understood via your website. In an increasingly data-driven world, businesses are finding ways to understand the motivations behind consumer behaviors and then applying that knowledge to a website that gives their potential and current customers a unique and memorable experience specifically catered to them. 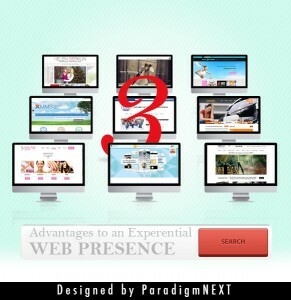 As a company experienced with the user experience, we at ParadigmNEXT hope that you take these 3 advantages to your advantage and launch a beautiful digital presence, with the focus being an experiential website. Yana Nirshberg is the Co-Founder, Managing Partner and Creative Director at ParadigmNEXT, Inc. ParadigmNEXT is a digital marketing consulting agency headquartered in Chicagoland. We service brands both directly and via their nominated agencies, ParadigmNEXT delivers a seamlessly integrated Brand Experience and a greater measurable return on marketing investment (ROMI). Services we provide include brand identity, integrated marketing, inbound marketing strategy, art direction, web-design & development, startup incubation and product development services to a wide array of clients ranging from bootstrapped startups to successful longstanding companies. We’re deeply rooted in the tech startup community in Chicago and abroad, and have great relationships with emerging seed funds, VC’s, startup founders, and collegiate entrepreneurs.